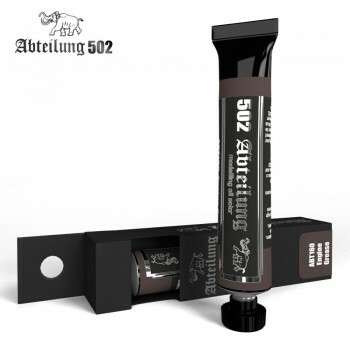 Abteilung 502 Engine Grease Oil Paint 20mlThis Abteilung 502 Engine Grease paint tube contains 20ml of high quality Engine Grease coloured oil paint.This colour is ideal for creating grease and oil effects on your vehicles, machinery and engines. It provides the correct transparency to replicate the effect of grease deposits. It is advisable to apply this randomly over the surface and let each layer dry in order to achieve different transparency degrees and more realistic effects. Can be used very diluted with white spirit as small splashes made with a toothpick on a certain area of the exhausts.